Scores of Burmese have been arrested overnight, as the country's military continues its crackdown following last week's protests, witnesses say. Security forces are said to be using recordings of the demonstrations to compile lists of activists for arrest. A source has told the BBC that as many as 10,000 people - many of them monks who led the demos - have been rounded up for interrogation in recent days. 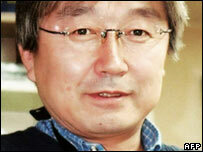 The body of a Japanese reporter killed during the protests has arrived home. Kenji Nagai, a video journalist with Japan's APF News, was shot dead while filming in Rangoon. Japanese officials say he was shot at close range, contradicting earlier claims by the Burmese authorities that he was hit accidentally by a stray bullet. Dozens are feared to have died during the bloody suppression of the protests last week. The BBC's Chris Hogg, in neighbouring Thailand, says if it is a tactic designed to scare people, it is working. Shari Villarosa, the most senior US diplomat in the country, described how arrests were occurring every night. She said discontent in Rangoon had been "simmering for years", but has now turned to a mood of "anger and fear". "It's been heightened by anger by what has been done against the demonstrators, the atrocities that have been committed against the monks," she said. One Burmese who was rounded up has told the BBC that between six and 10,000 people have been held in detention camps for interrogation over the protests. Many of those were monks. US diplomats said they had visited 15 monasteries and found them empty. Others were being barricaded and guarded by soldiers. Reuters news agency reported that a slow trickle of monks and nuns were being freed from detention centres near Rangoon. 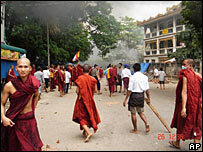 Some told the agency they had witnessed monks being beaten while they were asked about their identity, birthplace, parents and involvement in the protests. The Burmese regime - led by reclusive General Than Shwe - has been condemned for its actions across the world. The UN's special envoy, Ibrahim Gambari, met the general in Burma to relay concerns, and is due to report his findings to Secretary General Ban Ki-moon later. Mr Gambari, who will brief the UN Security Council on Friday, also met opposition leader Aung San Suu Kyi during his visit. 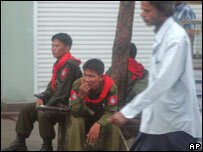 Burma has been under military dictatorship since 1962. Multi-party elections were held in 1990 and were won comprehensively by Ms Suu Kyi's National League for Democracy party. But the ruling junta - known for its corruption and mismanagement - dismissed the results and continued to exercise a stranglehold on power.